Sacred site: The site of the Church of the Holy Sepulchre in Jerusalem is identified as the tomb of Jesus of Nazareth. 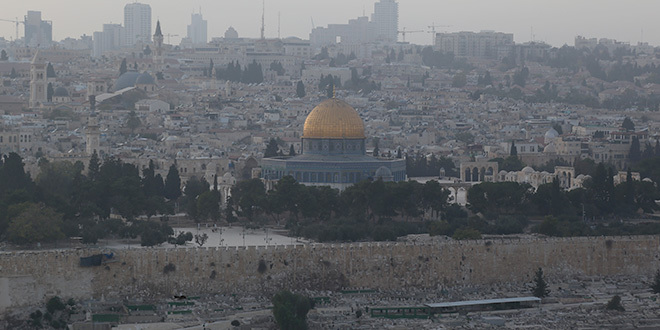 A VISIT to Jerusalem can be an opportunity for pilgrimage, reflection and quiet prayer at holy sites. It is also an extraordinary window into the reality of an ancient city in a conflicted land. It’s easy to lose yourself in the winding, cobblestone alleyways of old Jerusalem amidst the jostle, the lively conversations in Arabic and Hebrew, and with the aromas of spices, coffee and freshly baked bagels and pita bread. 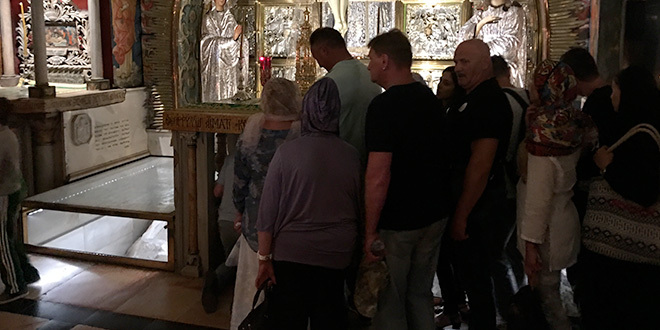 Christian pilgrims from around the world pack the narrow passages along the Via Dolorosa, following in the footsteps of Jesus as they retrace the 14 Stations of the Cross towards the Church of the Holy Sepulchre, the site of Christ’s crucifixion. Pilgrims are often warned their presence could cause offence – even spark verbal abuse or worse – as they pass through the Jewish and Muslim quarters. I saw no evidence of it, but here religion and politics are never far apart. It is just a few days since Prime Minister Scott Morrison flagged moving Australia’s embassy in Israel from Tel Aviv to Jerusalem, a policy change that would align Australia with United States President Donald Trump’s controversial embassy move here this year, and would antagonise Arab and Muslim nations. “It doesn’t worry me either way,” spice seller Ali told me in the old city. Bethlehem city: A street scene in Bethlehem, the birthplace of Jesus. The presence of heavily armed Israeli soldiers is a constant reminder of the current state of play in a city whose name literally means “peaceful”. So too is the “Jerusalem envelope” – a barrier that snakes for 200km through Jerusalem. In some places it is a nine-metre-high concrete wall, in some parts it takes the form of a chain-link fence. Palestinians see it as Israel’s attempt to expel them from Jerusalem (about 90,000 Palestinian residents find themselves outside the wall); Israelis see it as protection from terrorism. This year marks the 15th anniversary since its construction. It has changed the lives of entire communities of Palestinians – economically and culturally – while advocates point to the dramatic decrease in the number of suicide attacks that have occurred in Jerusalem. Ancient shrine: A view of the Dome of the Rock, an Islamic shrine on the Temple Mount in old Jerusalem. Tens of thousands of Palestinians cross the wall’s check-points every day to enter Jerusalem, which is now enjoying rapid growth well beyond the walls of the old city. The skyline is spotted with construction cranes building apartment blocks, trendy shopping malls and modern hotels. In contrast, across the wall, Palestinian communities languish – places as famous as Bethlehem and Ramallah. Bethany, or al-Eizariya as it appears on modern maps, is a West Bank city just 2.5km east of Jerusalem. 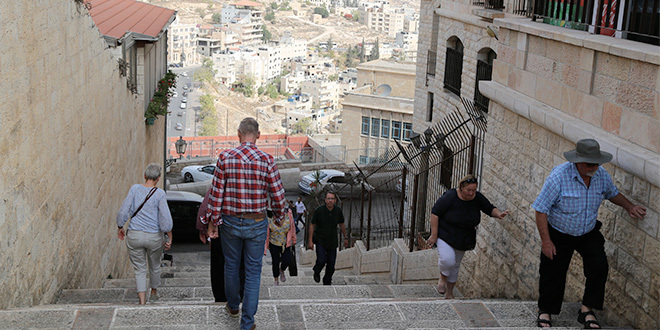 It lies on the south-eastern slope of the Mount of Olives, and is recorded in the New Testament as the home of the siblings Mary, Martha and Lazarus. It could be from Bethany that Jesus parted from his disciples at the Ascension. Outside the site of the reputed tomb of Lazarus, I met Zed, a 34-year-old Palestinian man on crutches, selling bookmarks with photo scenes of Jerusalem. I point to a bookmark photo of the Dome of the Rock, Arabic Qubbat al-Sakhrah, shrine – sacred according to his Muslim faith. “One time, when I was ten,” Zed said. 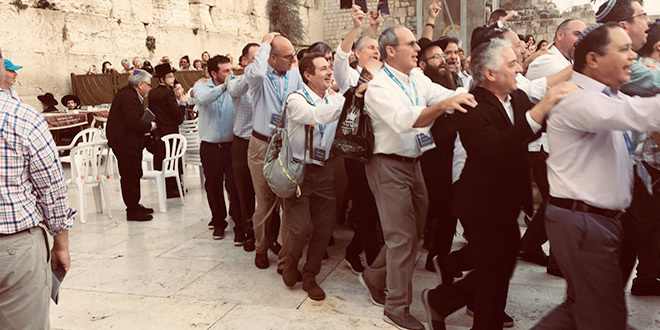 On Friday afternoon, just before the start of the weekly Shabbat, I don a kippah and head to Jerusalem’s holy Western Wall. It’s a flurry of noise and excitement. Prayers are being recited and candles lit in anticipation. Men – young and old – form a line holding the shoulders of the one in front and dance in a tight circle, chanting as they go. Nearby, women observe the spectacle from a cordoned-off female section. A little further away in the square, young soldiers, girls and boys serving out their compulsory national service – are having a night out too, dancing and singing together, semi-automatic weapons slung across their shoulders. I approach the Western Wall where orthodox Jews are praying aloud, eyes closed, swaying back and forth. Small, folded pieces of paper – written prayers – are inserted into the crevices between the giant stones. I touch the Wall and say my own prayer – for peace here in this divided city, and around the world.